The term messy garage people has stuck in my head ever since. And I can’t help but think that there are so many people out there who just think they are destined to always have a messy garage … and so of course they have a messy garage, because hello – self-fulfilling prophecy! True change starts with a clear picture of where we want to go and the sincere vision that we CAN get there. You can know where you want to go, but if you don’t really trust yourself to get there, it may never happen or the change may only be temporary. There has to be a shift in thought where you decide that you are capable. I can tell you a million times that I’ve seen amazing progress in the most unlikely people, and that I believe there is no one incapable of doing great things, but until you tell yourself that too, what I say doesn’t really matter. 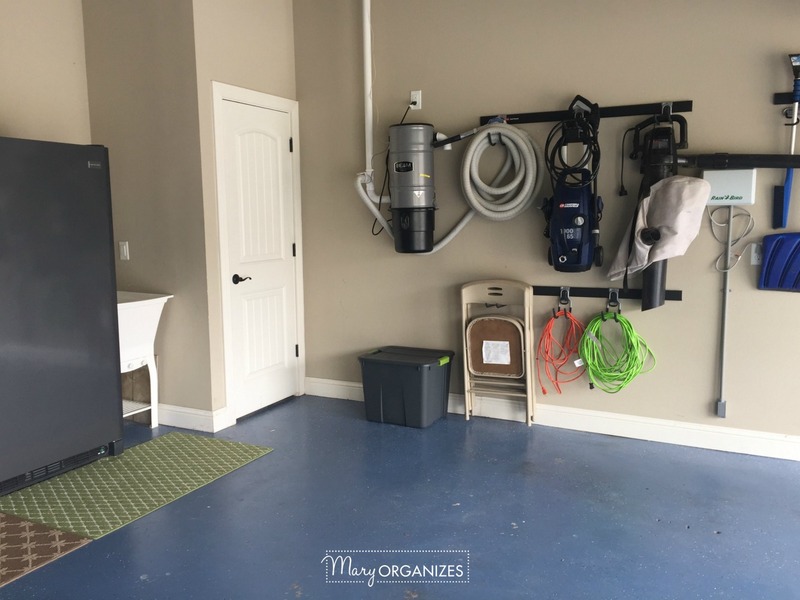 This probably wasn’t what you were expecting to read when you clicked on an article about “How To KEEP Your Garage Organized”, and honestly it wasn’t the post I planned to write before I sat down, but as I started to write the list below, I realized that the most important first step was just deciding that you could maintain an organized garage. Decide that you can have a clean and organized garage and keep it that way. Thanks to Garage Week, I now have lots of Garage info out there to help you get your garage initially organized. Before you can maintain, you’ve got to get there first. 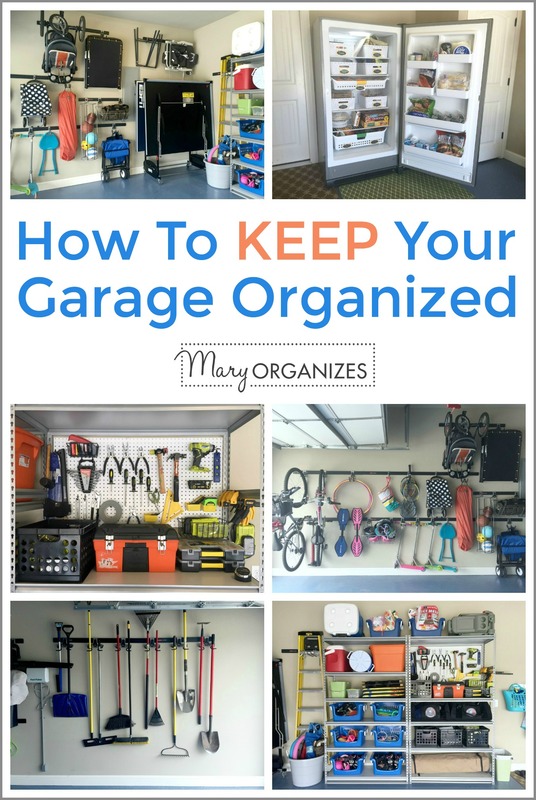 Included in the Garage Week Resources is a specific post “Let’s Organize The Garage” with specific tips and strategies to get you through organizing your garage. Step 3 – Don’t let things build-up. Garages are catch-all places. I can’t begin to name all the things it will catch for you, but here are some examples. Example 1) You come home from camping and are tired and leave all the equipment out to “clean up another time”. Example 2) At the end of soccer season, all of the soccer supplies end up in a pile on the floor. Example 3) You just volunteered to run a big event at church, and all of the leftover stuff ends up in a pile on the floor. Example 4) You start a project in the garage and get side-tracked and leave everything out, project incomplete. Example 5) You complete the project above, but still leave all of the project stuff out. 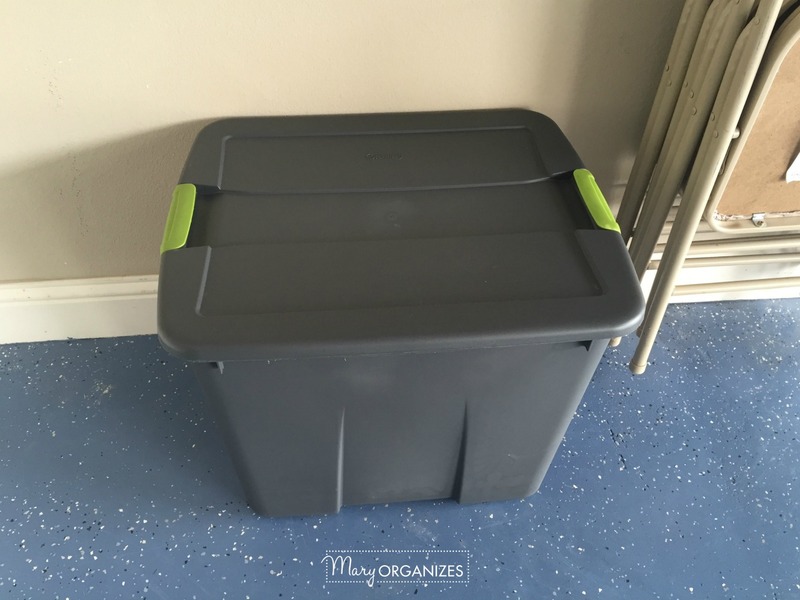 Example 6) You clean out some rooms inside and bring out donate items to the garage, but they never make it to be donated … they just sit in the garage. You may have any or all of these, or even more and different things that could happen to your garage at any time. One of the biggest things for maintaining your garage is going to be training yourself to take care of these things right away. You’ll notice that the cleaner you keep your garage, the easier it is to do this, because the mess it isolated to what just happened. And also, you’re motivated to keep it clean! Oh boy, looks like it’s already time for me to take a donation run! Bye-bye sippy cups! I let the seasons help remind me to refresh my garages organization. Even doing my best to take care of things right away, slowly, the garage slips into being a little messier over time. The great thing about maintaining an organized garage versus constantly re-organizing, is that these refreshers only take part of your Saturday to complete. In fact, pull out your calendar right now, and schedule these appointments in for yourself! During this clean out, I’ve found personally that my donate pile has usually spread past it’s small container. It may be something about those crazy cold months, but I’ve noticed it is harder for me to get myself to open the garage to just load stuff right in to drop off to donate, so it is more likely to get in a pile. Your circumstance might be different, but the idea is to just clean out the garage, and get things back into their former organized state and give the garage a good sweeping and dusting. This is the corner, right by my Donation Station, that can get pretty full of donate items at the end of winter! This is when you are pulling out the garden stuff, getting the pool stuff prepped, and making sure your garage is organized and ready for it’s “busy season”. This maintenance session is when you are putting away all of the summer stuff, closing things down for the winter that need to be closed down, and getting things organized and ready for it’s “down season”. Things get really dusty and grimy and dirty if they are left out over the winter. Make sure things are put away and covered so they are nice and usable the next spring. You’ve organized your garage, but if something isn’t working – fix it. I like to call these little fixes tweaks. Don’t do what I did for my recently Re-Organized Garage, and wait too long to get it the way I wanted. There were so many little changes I could have been making along the way! With the right mindset and some good habits, you can have an organized garage ALL.OF.THE.TIME. Yes, I’m talking to you – it is completely possible! Thank you! I love how “normal” you are! Our garage got decluttered and swept out. We have a huge box ready for donation ( a lot from the declutter challenge) and hubs promised to go through his tools and sports equipment. We put a huge dent in it! And it’s become tradition at the end of our bi-annual garage clean out I say these words “I’ll never let it get this out of control again!” HA! I am proud that we do clean it twice a year and so although it gets messy and disorganized, it’s not for long. I’ll send pics on FB soon. If you have a system for maintaining it, that is very good! Is it a little better every time? 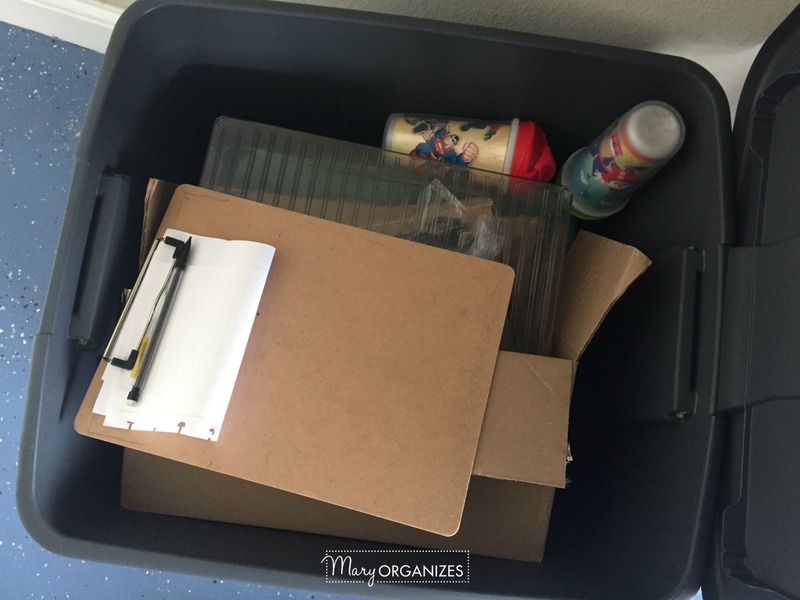 Organizing is a journey, so if slowly over time you are getting it to a state where it is less chaotic in between maintenance cleanings, I think you’re going in the right direction! Sooo, if there are messy garage people, then there must be messy attic people…..lol. We don’t have a garage, but an attic where everything goes that doesn’t have a home….do you have a solution for that? I believe that the things we have that don’t have a home, we should get rid of/ declutter those things.